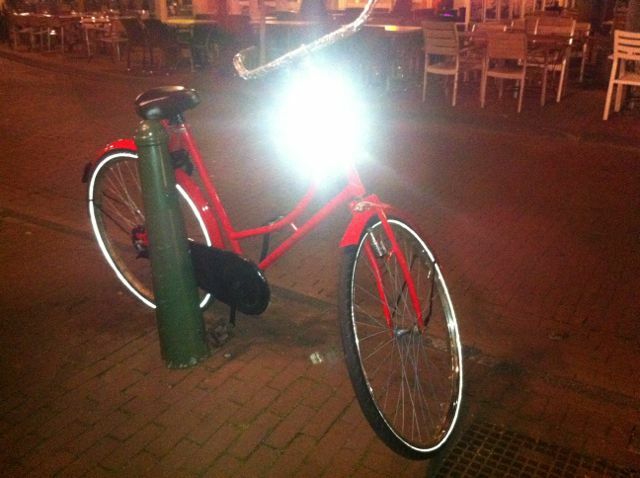 Poor security, or just the fear of things being pinched, is another barrier to regular bike use. Even for those that persevere, what seems like a sensible value-for-money solution can turn into a royal PITA if you can’t rely on it being on the bike when you return. Lights are a prime example. Emerging from a shop to find someone’s walked off with your wheels isn’t. Not only will you have to walk home you’ll have to carry the bike as well as the shopping. More often than not this’ll be down to another gift from the world of cyclesport; the quick release lever. My Big Apple tyres were doing well, puncture wise, when I was using that bike and were more comfy than the Marathon pluses. For just town i like flashing lights on my helmet. There’s enough light in this small city to not need anything else. At the Cycling and Society Research Symposium a guy researching the Dublinbikes scheme said many interviewees commented on how great the baskets were – even though they wouldn’t consider fitting one to their own bikes. 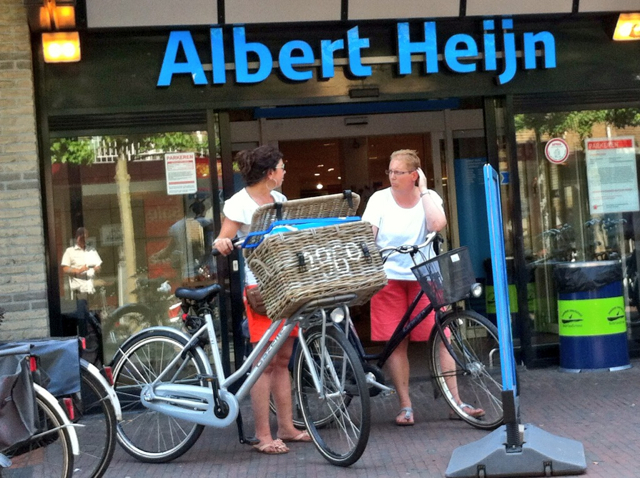 It seems baskets aren’t cool even if hire bikes are, but I expect the hire bikes will help normalise them. Just as living in Germany did for me. Great series Kevin. Looking forward to Part III. Basket fashion is quite easy to deal with. If you’re a hipster, baskets are hip. If you’re over 50, then you likely also happen to be an original hipster so, baskets are hip for you too. For those who don’t fit neatly in to either hipster crowd, or don’t eat at Bistroteque, there’s the tried and true issue of function over form, to be “in” is to be functional, putting form over function is so out of date. Thanks Walker. It’s about time I buckled down to it actually – deadline looming. I agree lights and locks are an endless source of faff. I recently found three rear LED lights in a drawer – and all of them worked…. Unfortunately with locks it is a bit of a situation where lock security is almost linearly associated with lock weight, and usually the frame connector thing breaks about a month after you install it, so you are left with lugging it around in a bag or banging your knees off it constantly, trapped in an endless cycle of angst of “It’s so bloody heavy” / “My bike is going to get nicked, I should have bought the bigger lock”…. I recently bought a road bike (my older hybrid is hilariously oversized and was doing my back in with 16 miles per day) but I have done my best to hybridise it between fast commuter and about-the-town pootler. So, rack and ortelib panniers with spd shoes (and lots of lycra) for the everyday run to work, but platform reflectors (so I can cycle in normal shoes) and one of these for popping to the shops. It’s a bit of a compromise, and the bent-over position isn’t as comfortable on short journeys, but it seems to work well! The detachable basket is brilliant – I can take it into the shop and use it as I would a normal wire basket (it’s very sturdy), so it is not one more thing that you are lugging around. It would be really lovely to have a key-locking bike with a stand that I could just leave outside the supermarket, but unless I could buy one for <£150 the sheer stress of leaving it outside in South London, not fixed to an immovable object, would be horrible…. That’s a great basket Hannah, not come across that style before. Not surprisingly, dutch style secondhand bikes are more abundant in the Netherlands and at a fairly reasonable price, certainly within the £150 limit, if that’s what you meant. Getting a bike that would serve both purposes though – shopping and a fast commute – for that price would be a tall order. Until that style of cycling becomes common prices here for that type of bike are going to remain high and your bike is going to remain more likely to get nicked. My default bike is a Brompton with the canvas folding basket and I don’t take any chances with that. I’ve got a 300mm long Abus D-lock that I feed through the saddle rails when not in use so it just hangs off the back of the saddle. At 300mm, if I’m leaving the bike anywhere for long time, it’s long enough to feed through both wheels and frame when folded and lock to a post. Not lost it yet despite leaving it outside pubs, cafes, etc in London and Oxford. It’s not a lightweight option, but like you say, the level of stress wondering whether it’ll still be there would be horrible otherwise.